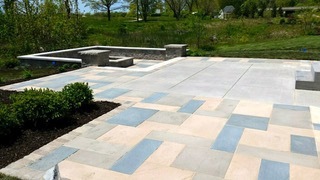 Client wanted a unique outdoor living space so we used a paver-slab three color mix with five different sizes. 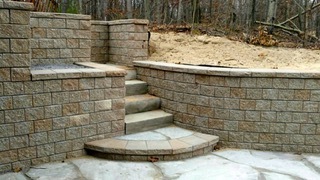 Customer wanted a Unilock wall system to replace rotted wooden wall and steps. 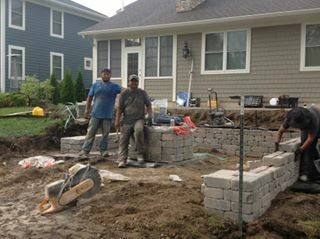 We installed 600 fc.ft.of Unilock Pisa 2 wall block. 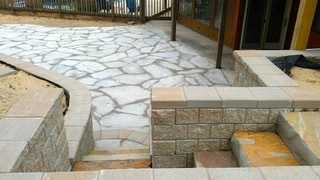 Installed 1100 sq. 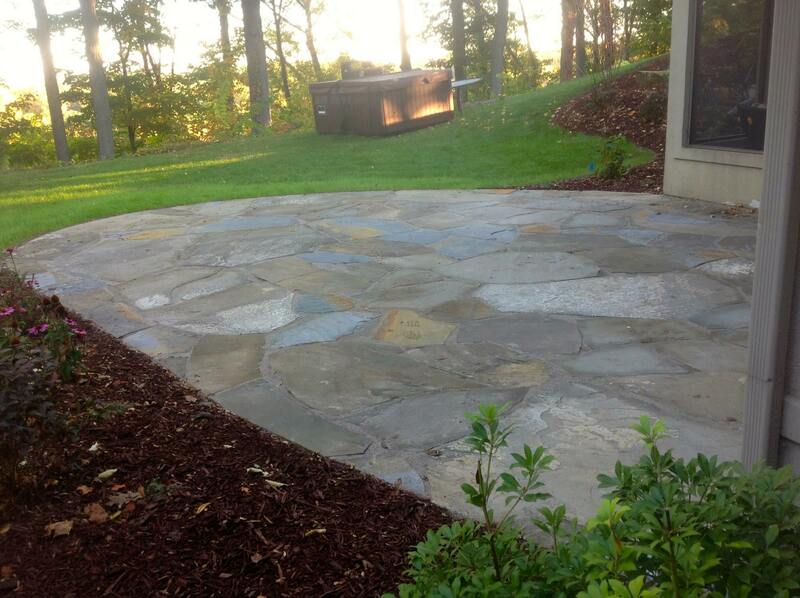 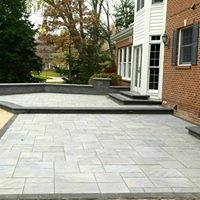 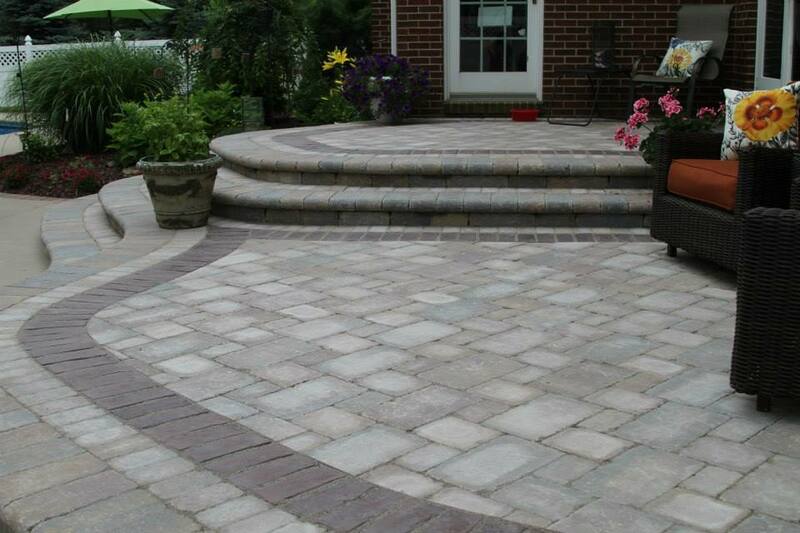 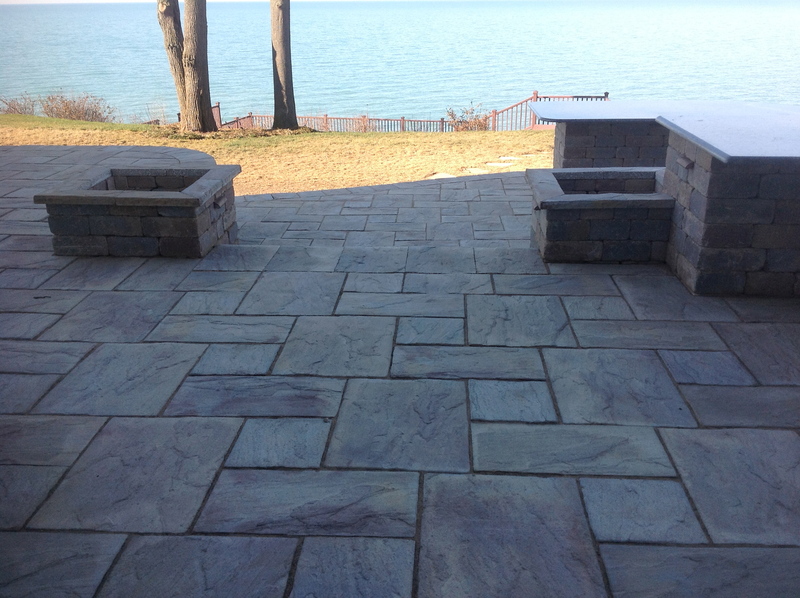 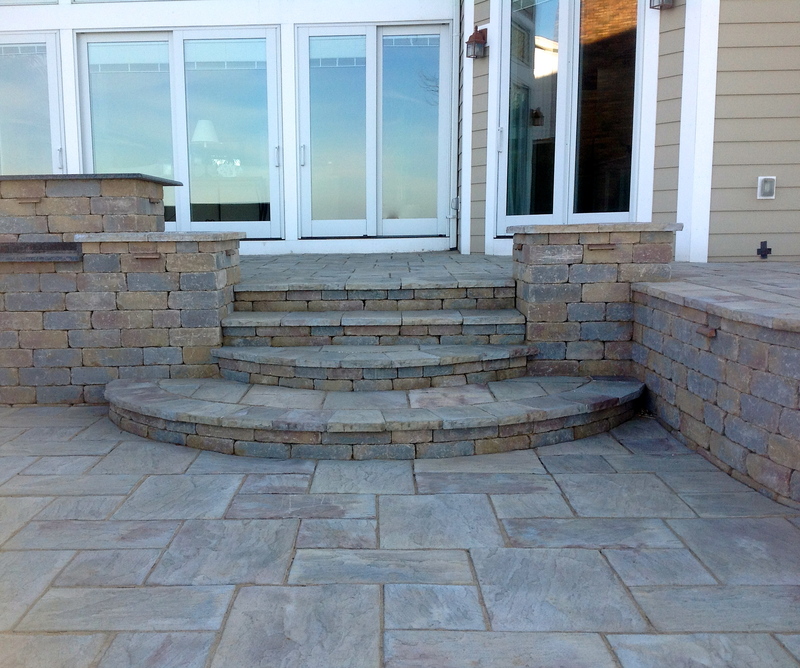 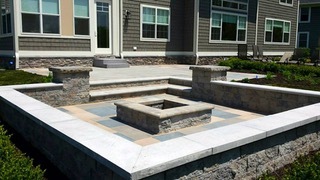 ft. New York blue flagstone with 3 ft. New York blue steps. 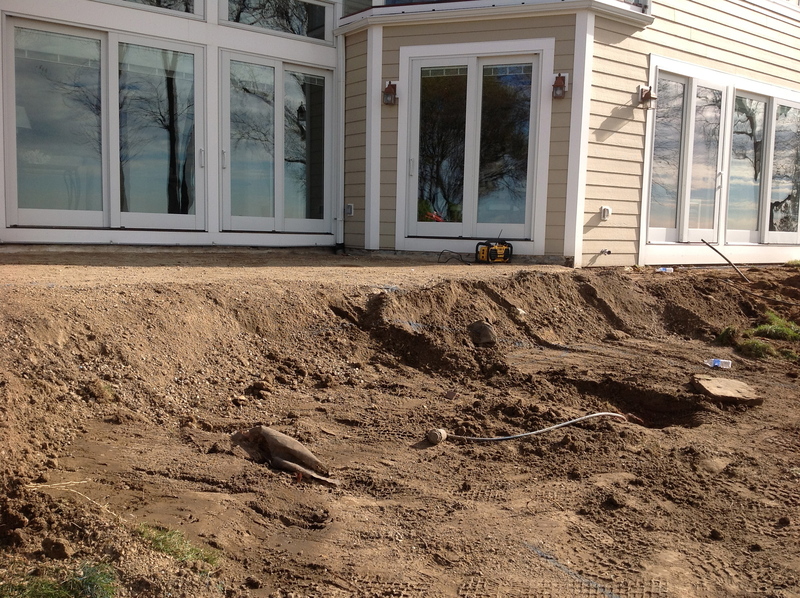 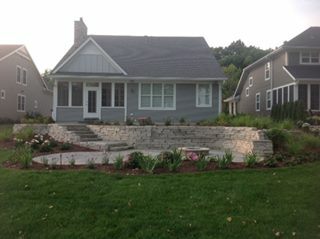 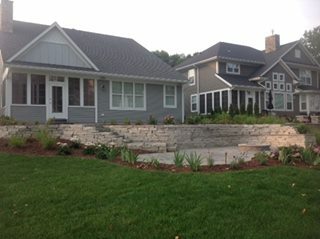 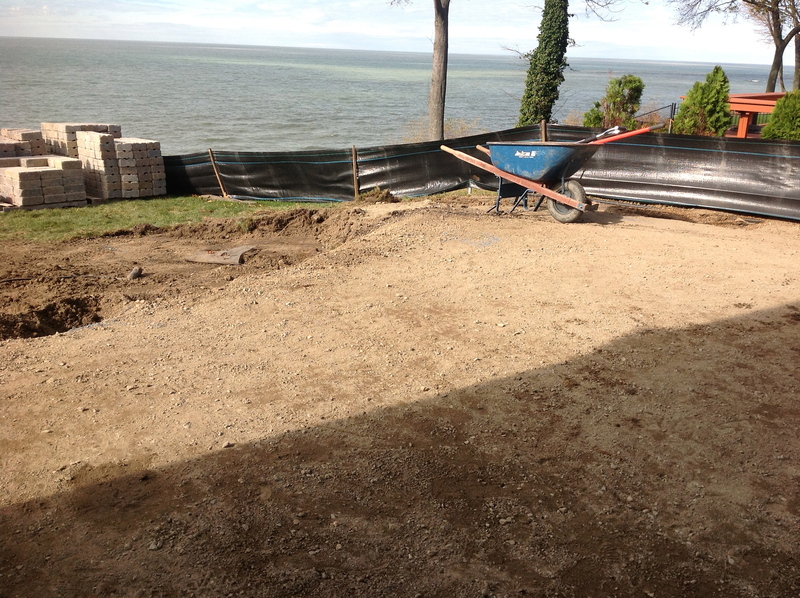 Lake Michigan Landscapes constructed 2.5 ft.high walls using 40 tons of Michigan White Outcropping. 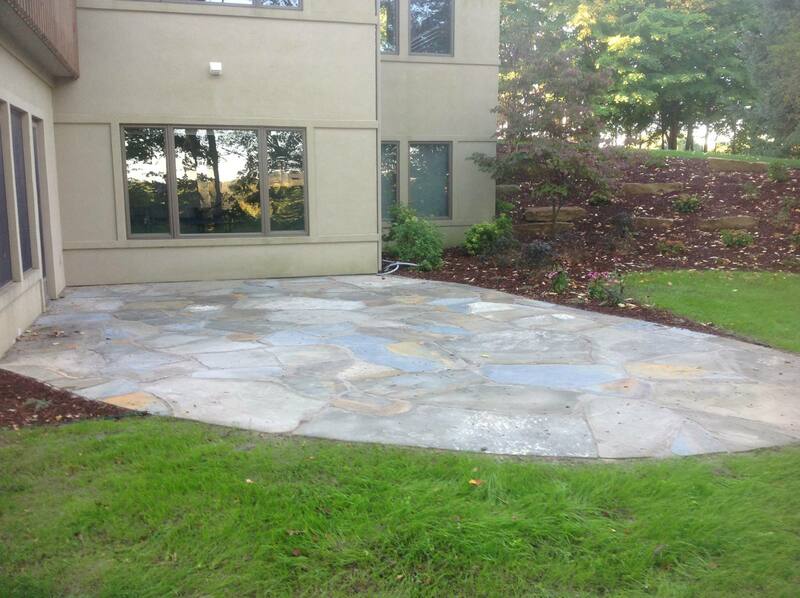 Installed bluetone steps and a 15 ft. circular bluetone patio with the fire pit material made out of the same outcropping materials. 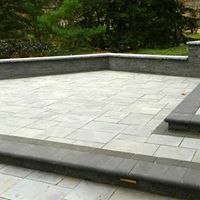 800 sq. 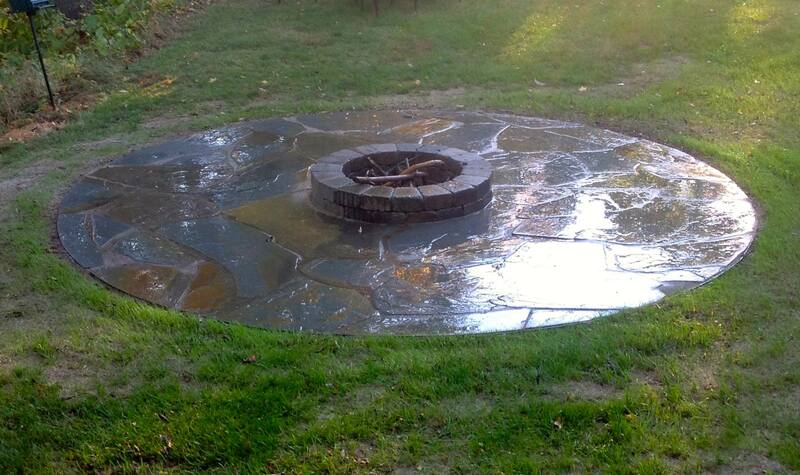 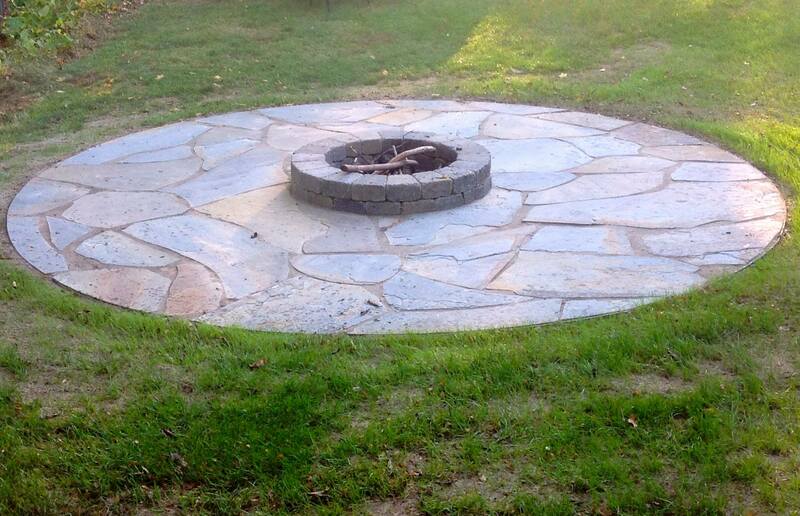 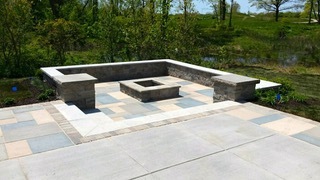 ft. of Techo-Bloc wet cast slab with matching fire pit with a natural gas line. 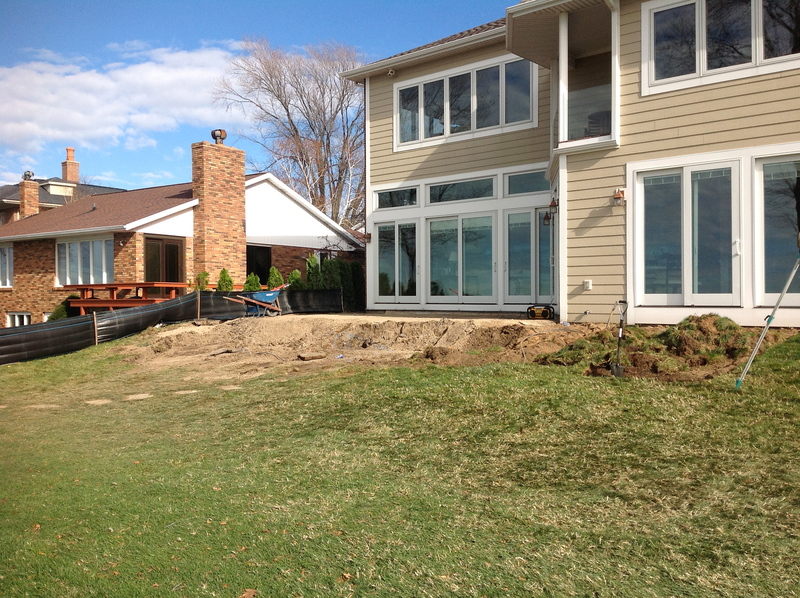 Tore out old deck and installed 900 sq. 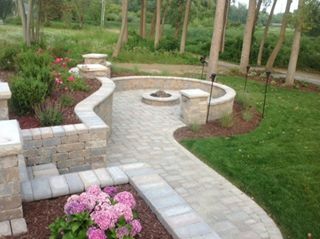 ft. of Techo-Bloc product. 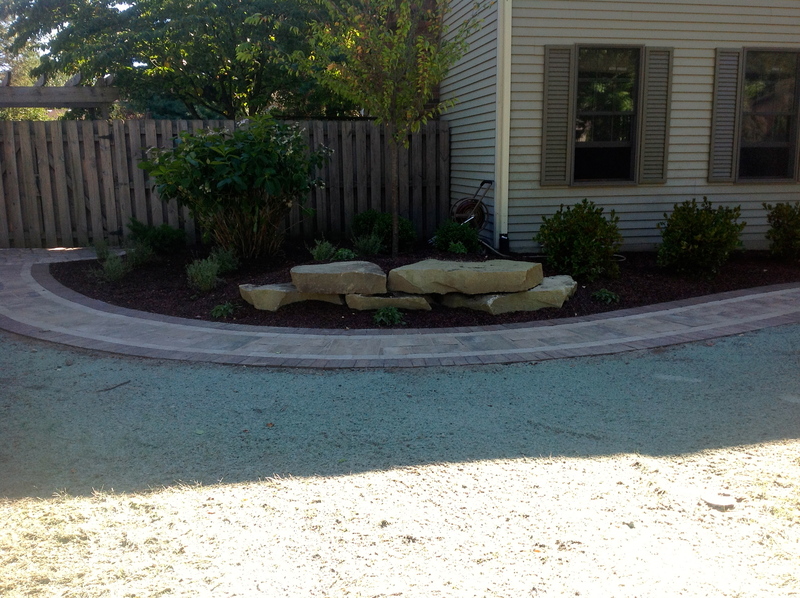 Installed 20″ seat wall with area for entertainment. 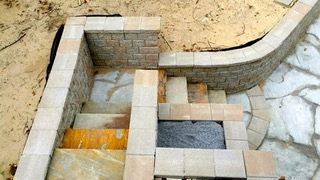 LED recessed lighting under the steps and in seat wall. 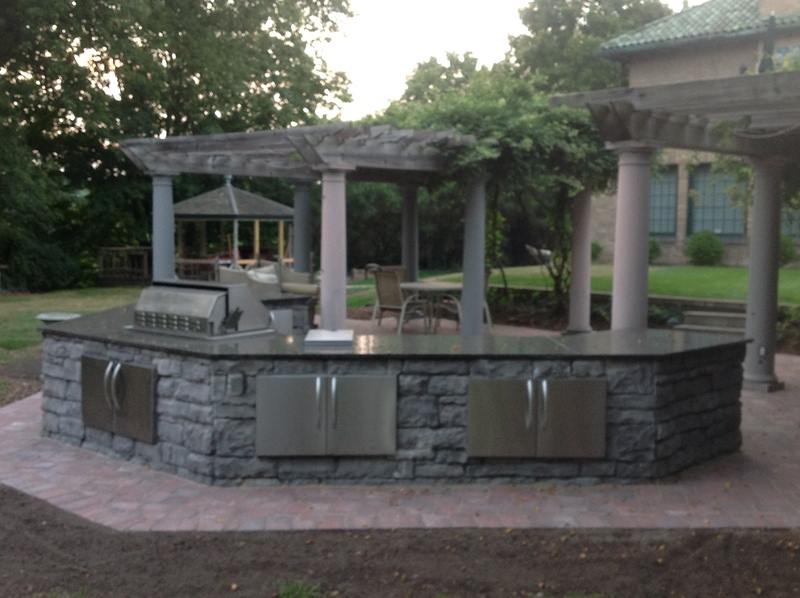 Client wanted outdoor kitchen and high-top dining for entertaining. 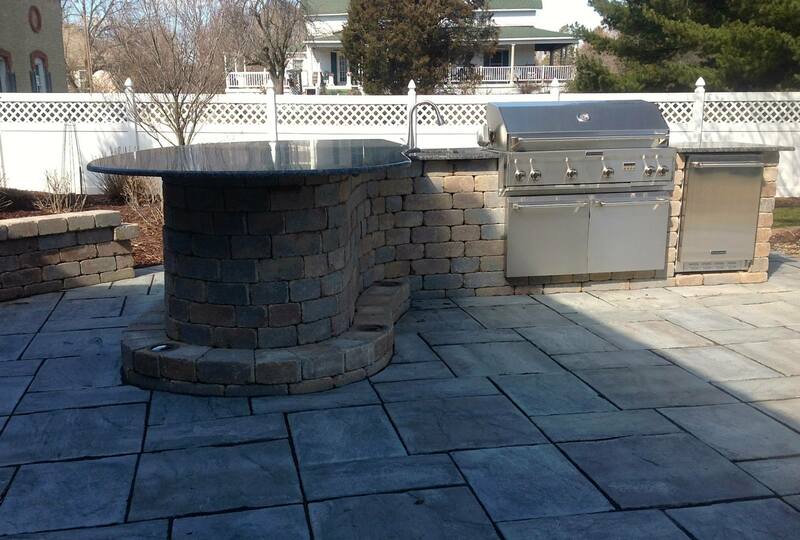 Unilock brick was used for wall and custom-ordered granite counter top with no seams. 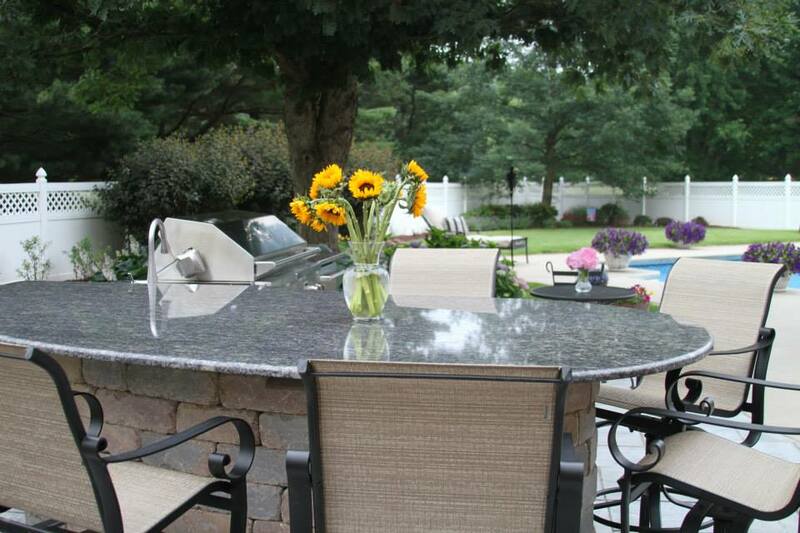 The color of the granite was a black sapphire complementing the color of the brick. 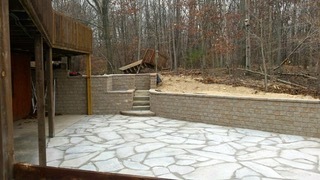 Installed Unilock pavers over existing concrete pad. 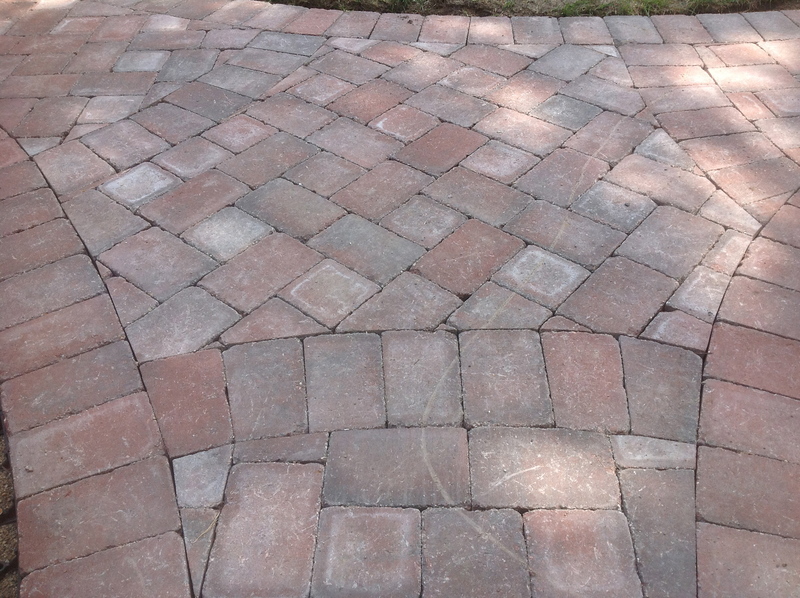 Used three types of paver colors to differentiate from neighboring houses. 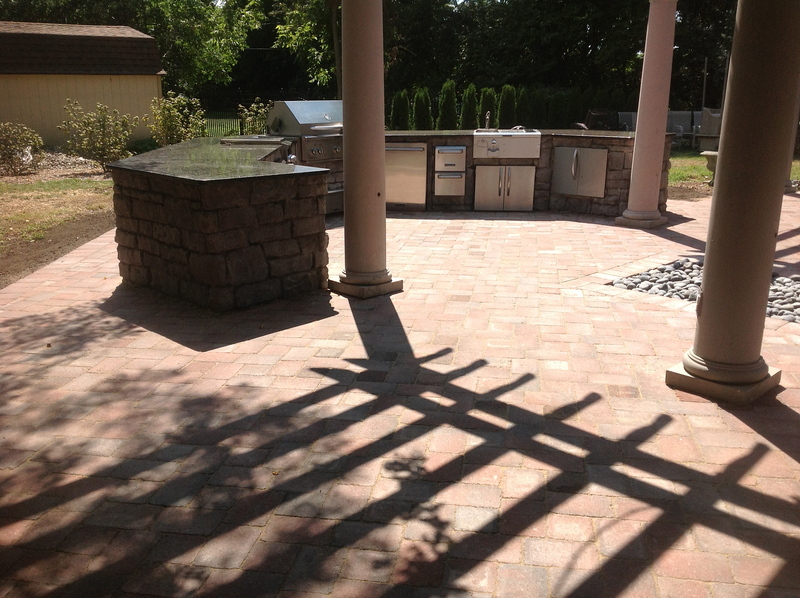 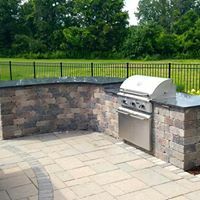 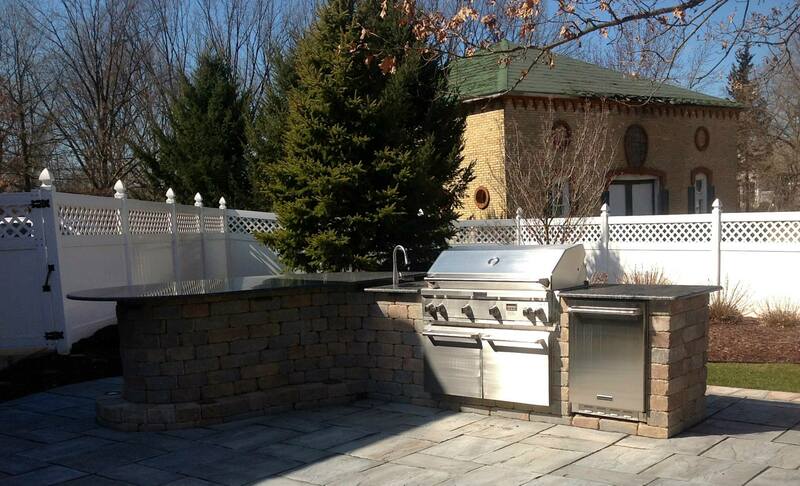 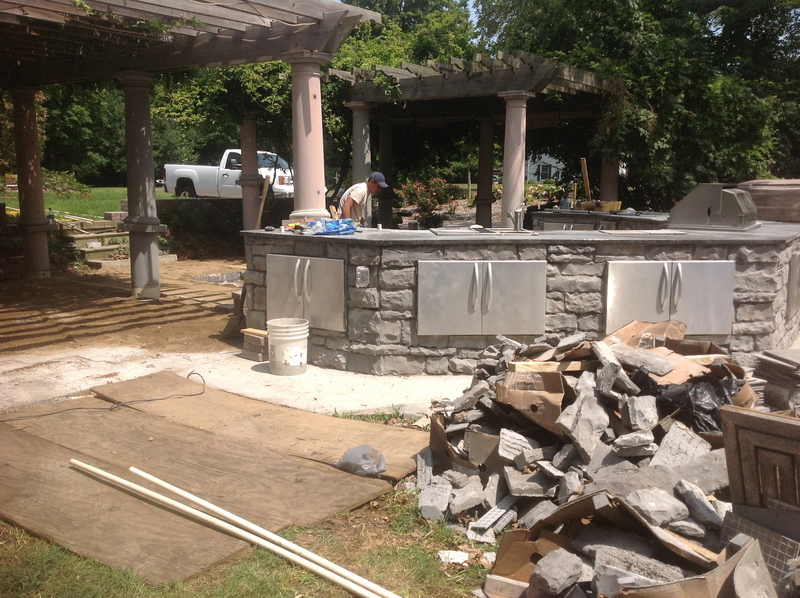 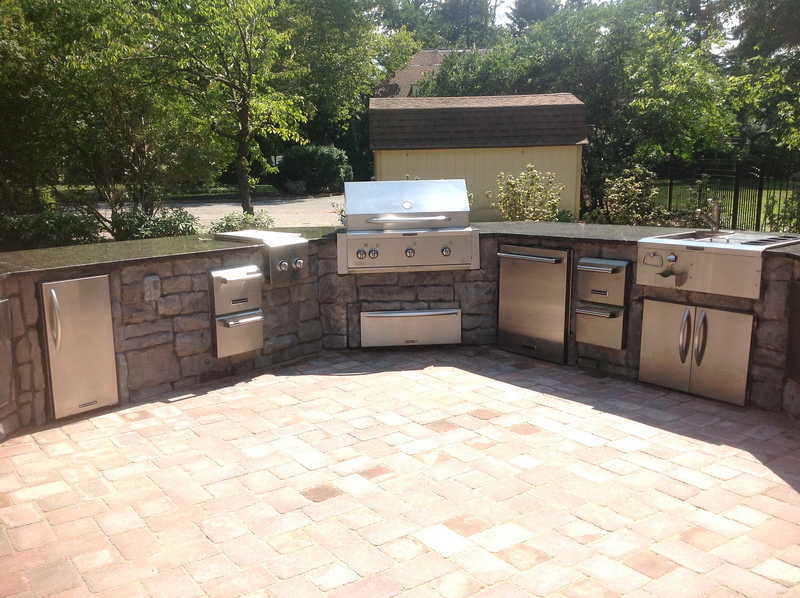 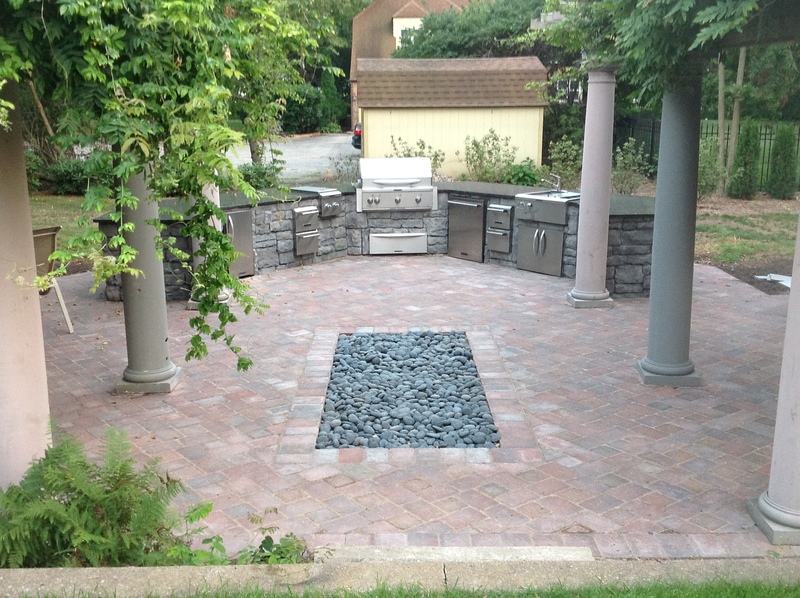 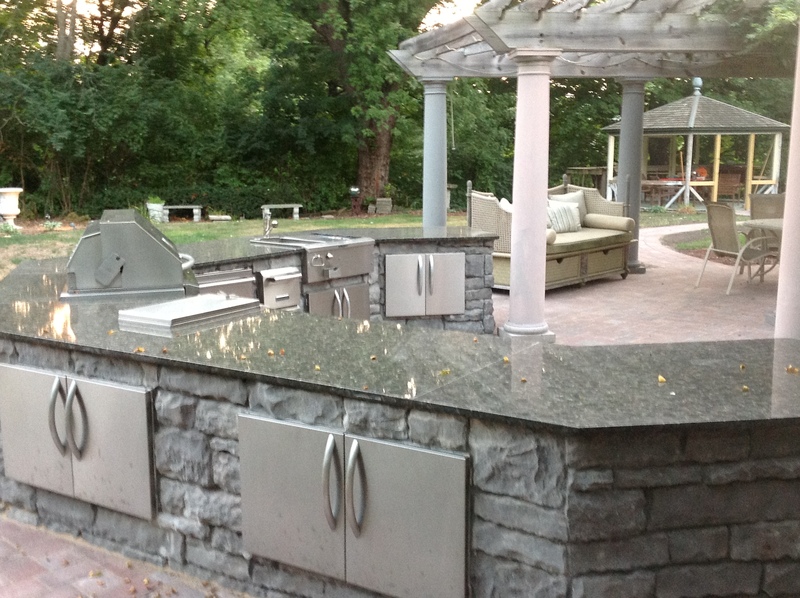 Built enclosure for existing grill with granite top and multi-tier seat wall….lower patio designed for 12 people to enjoy gas fire pit. 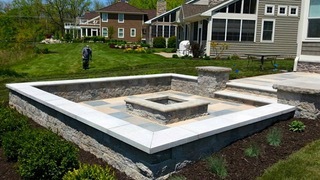 1000 sq. 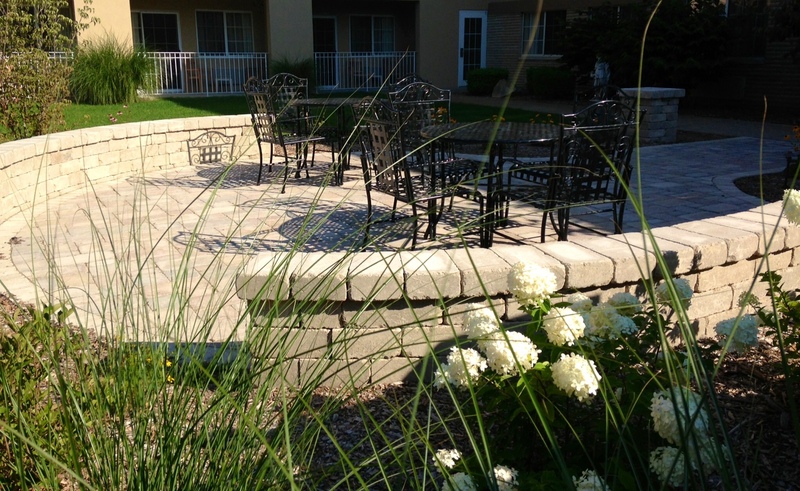 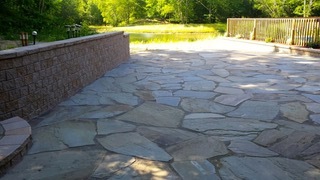 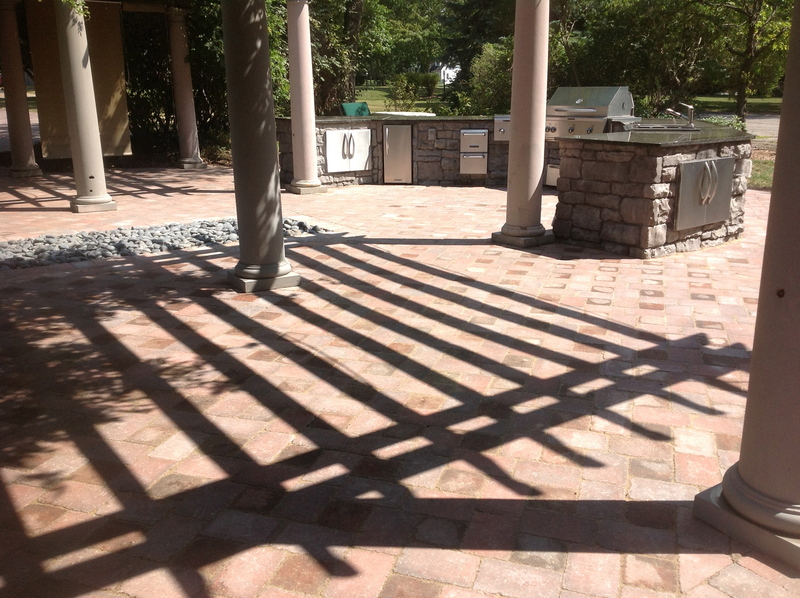 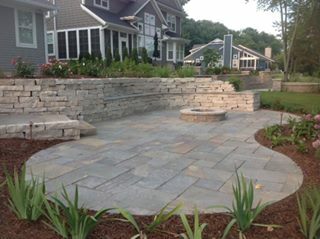 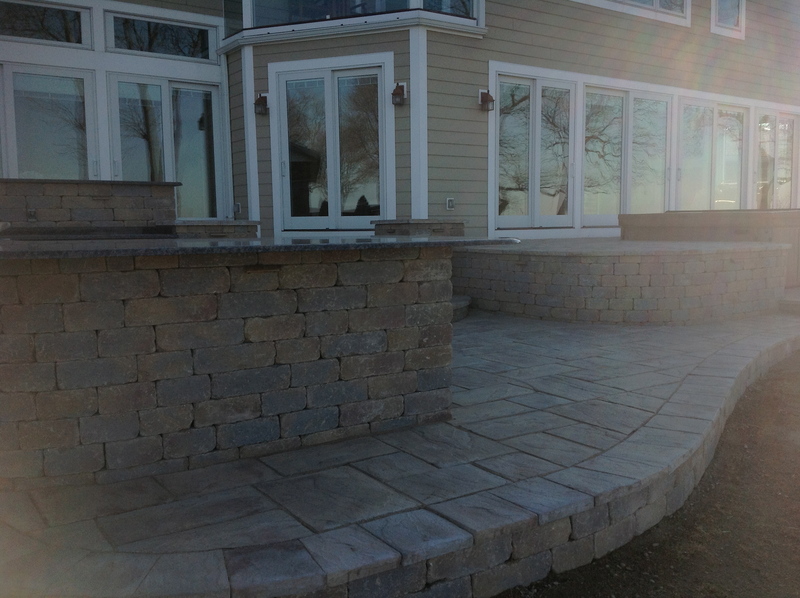 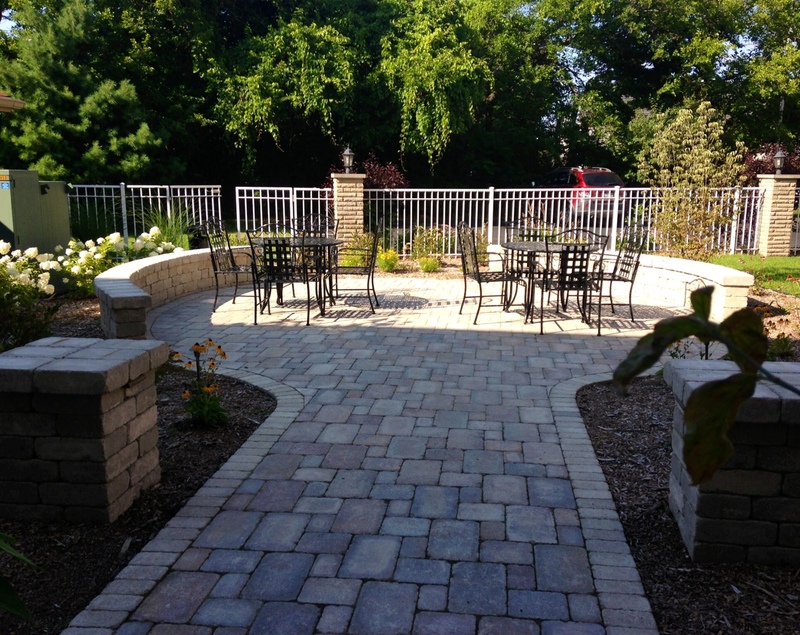 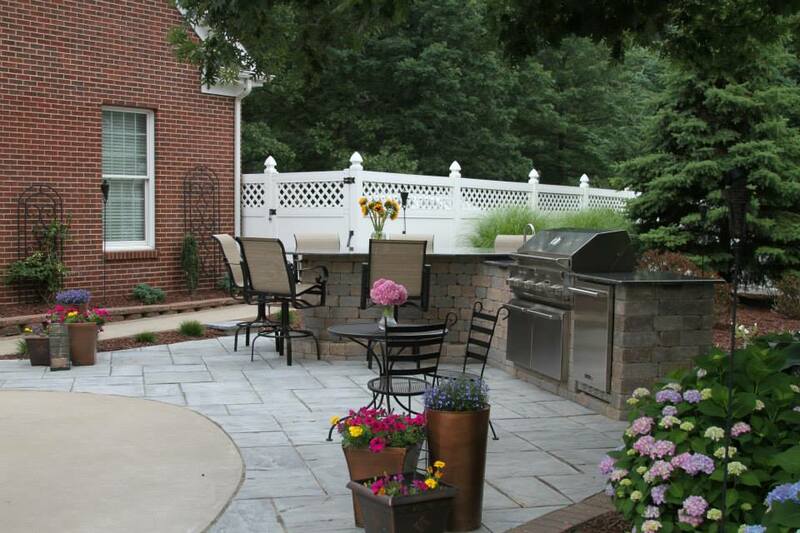 ft. of New York Bluestone was used as patio material/seat wall coping…natural cut stone installed for wall. 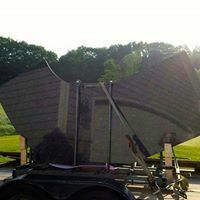 800 lb. 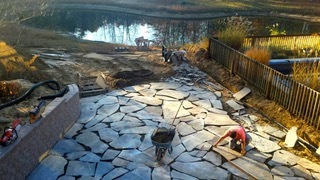 New York Bluestone steps leading to lower patio level. 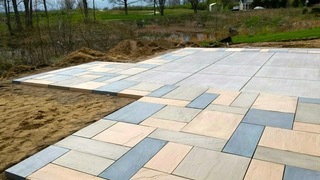 1100 sq. 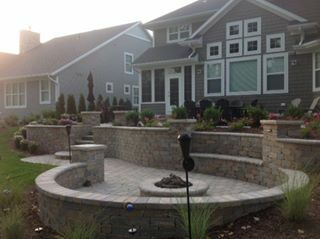 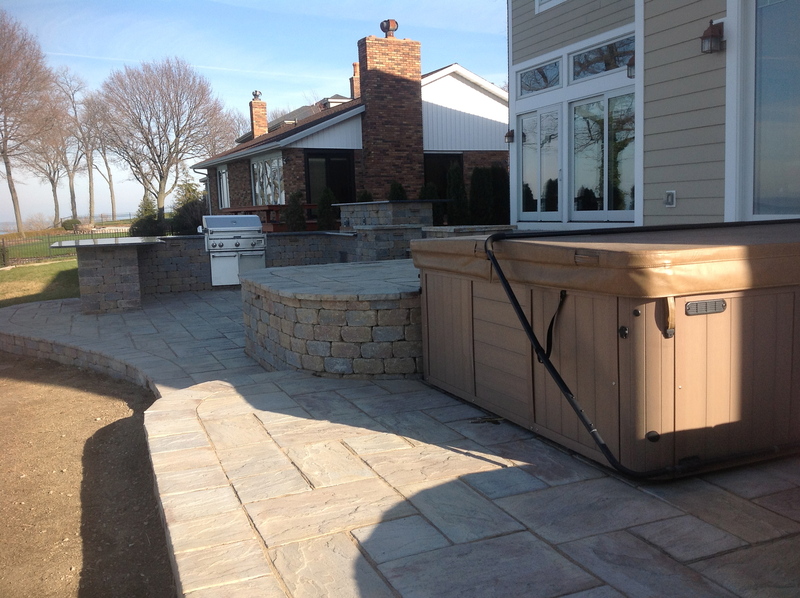 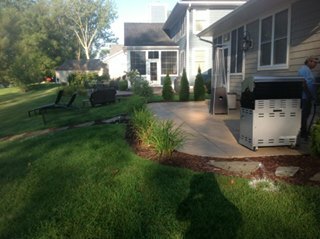 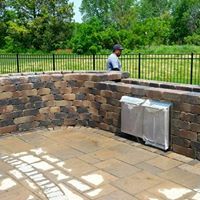 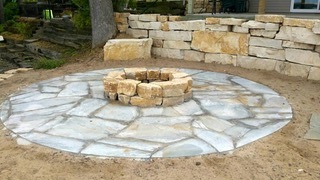 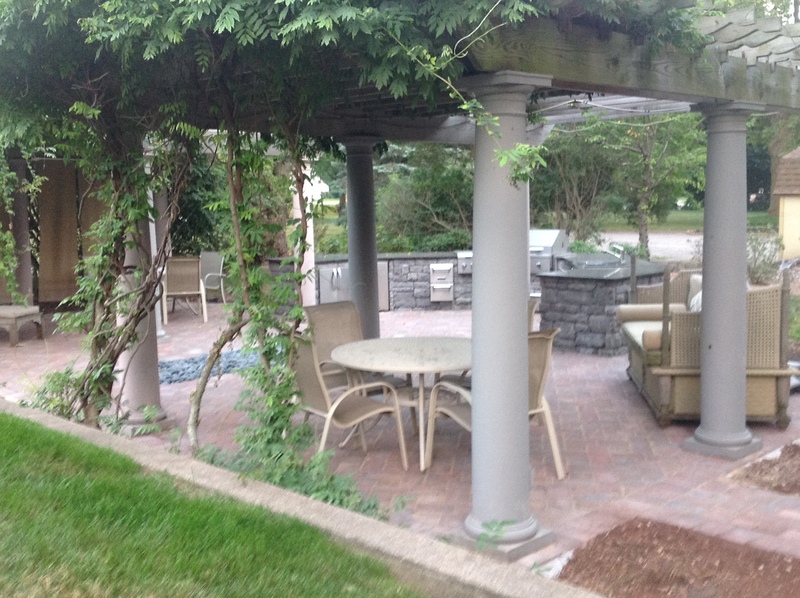 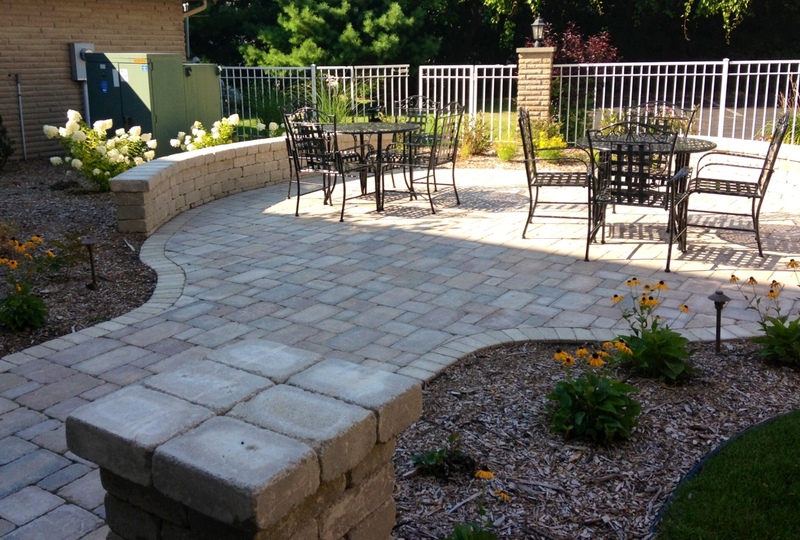 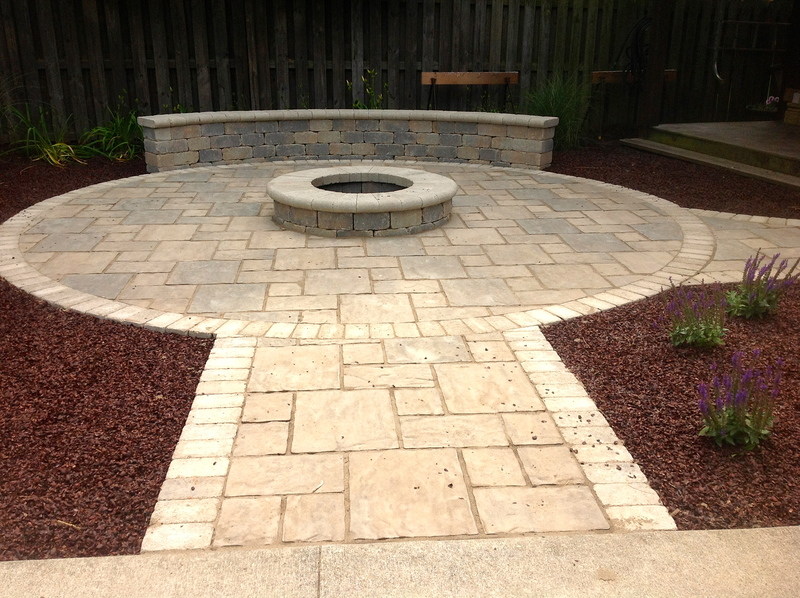 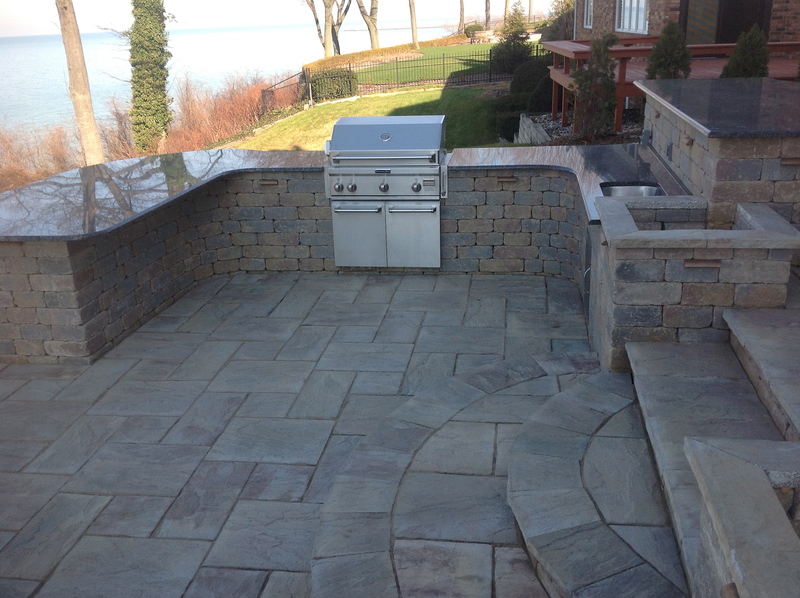 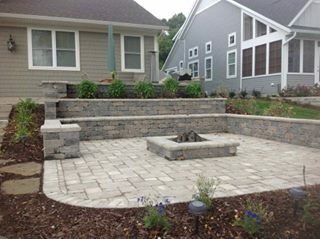 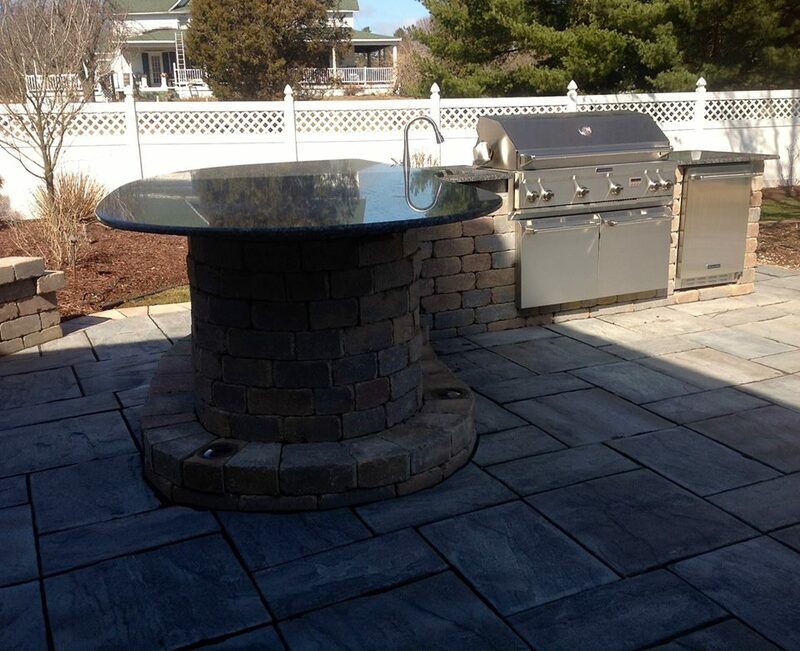 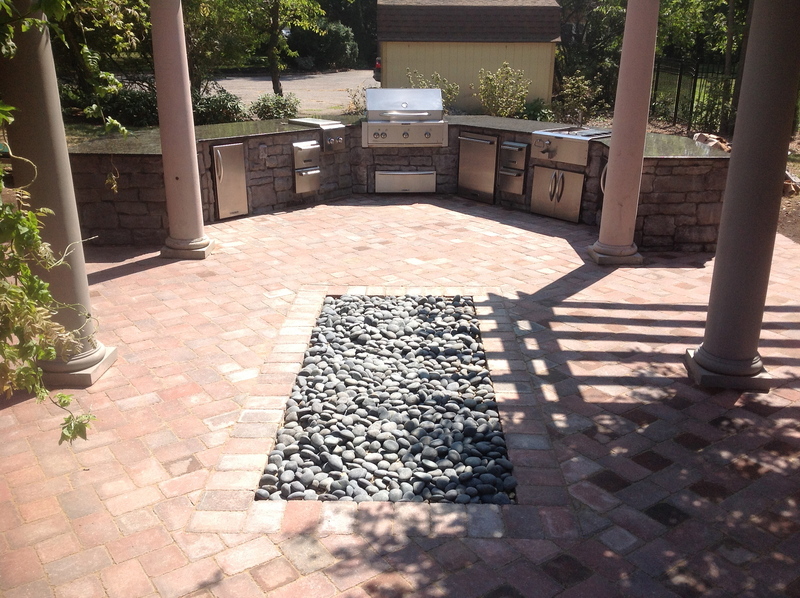 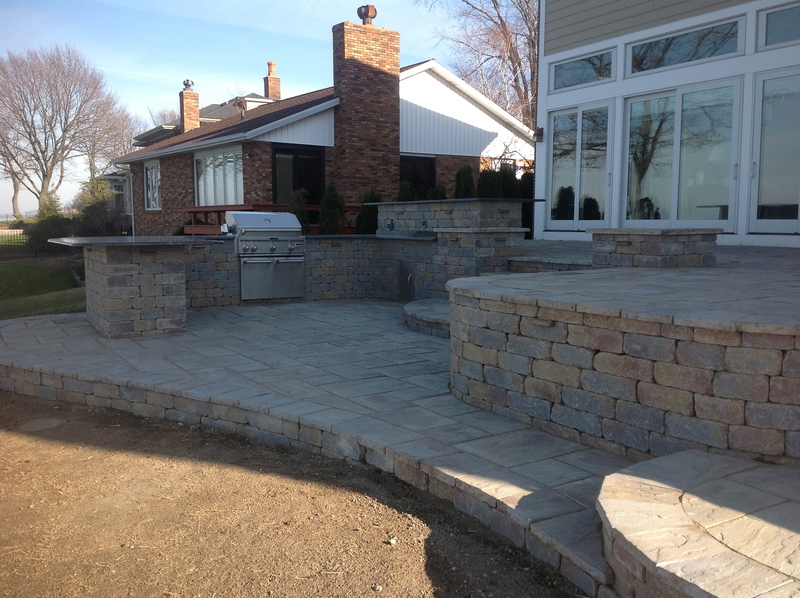 ft. two-tier outdoor living area….Unilock pavers with gas fire pit and built-in circular seat wall integrated into retaining wall. 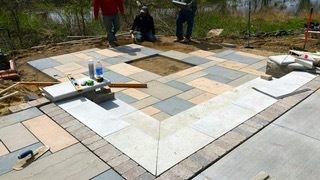 Client wanted a “one of a kind” hardscape design using various pavers integrating different textures/colors/sizes surrounding the pool area. 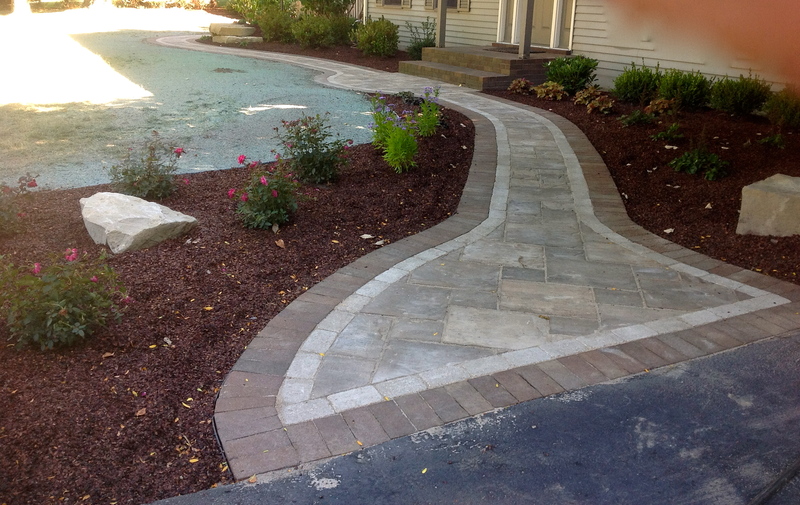 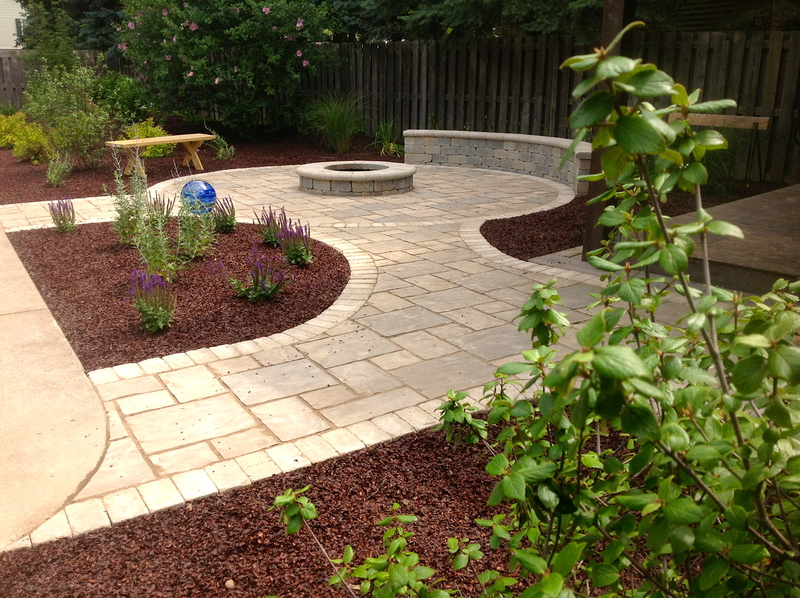 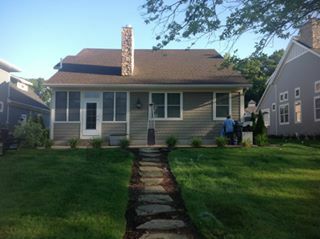 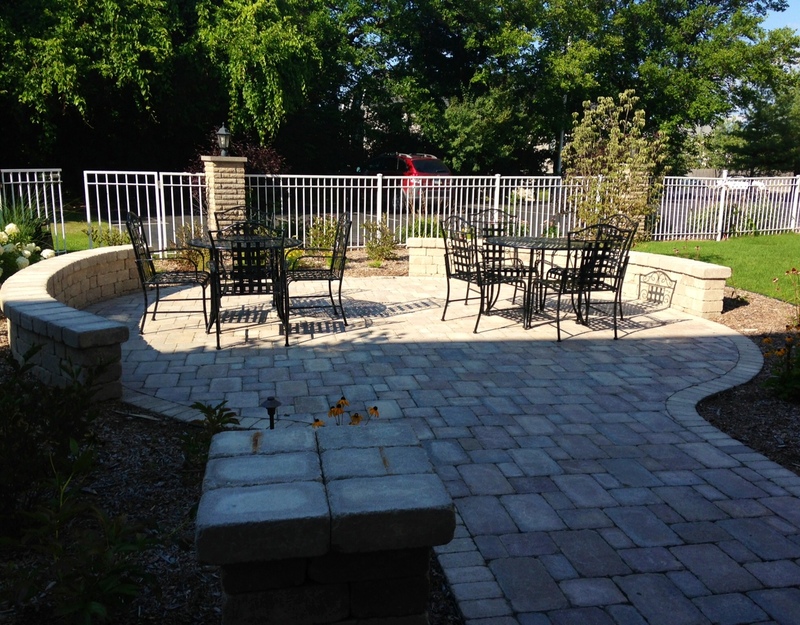 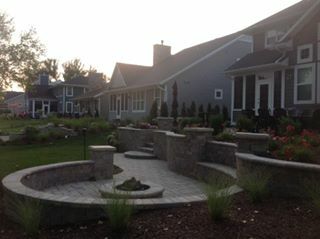 The front yard design included existing pavers as well as two new paver styles. 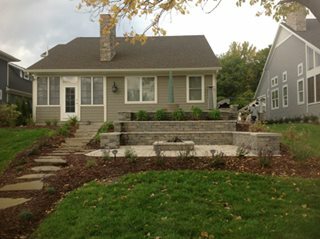 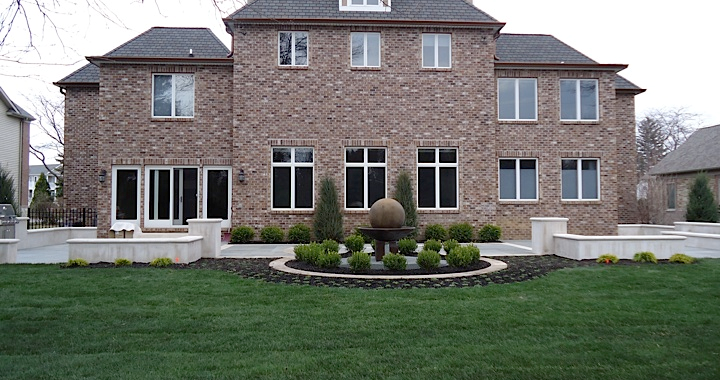 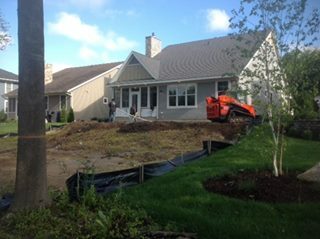 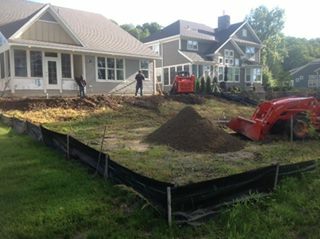 The landscaping involved removal of every single planting and installation included hydrangeas, lilacs, roses and ornamental grasses. 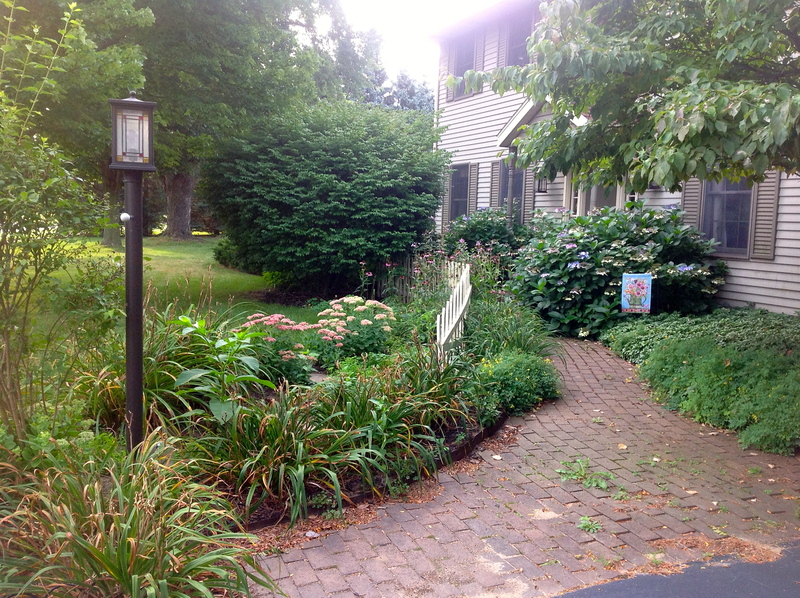 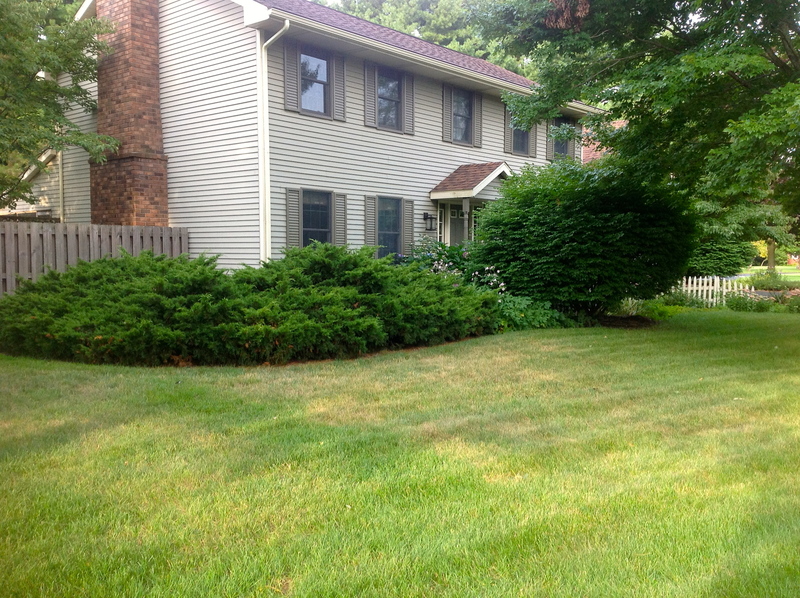 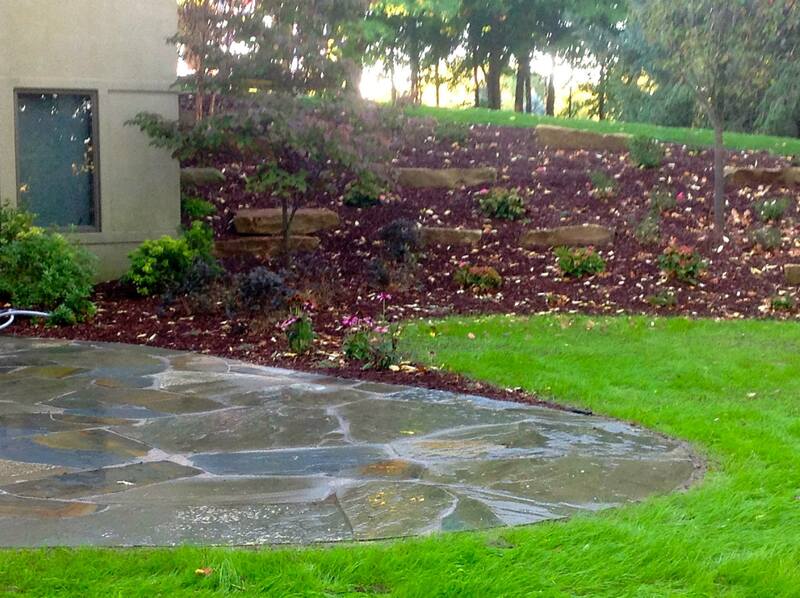 The landscape design focused on mass plantings throughout, bringing out vibrant colors during both spring and summer. 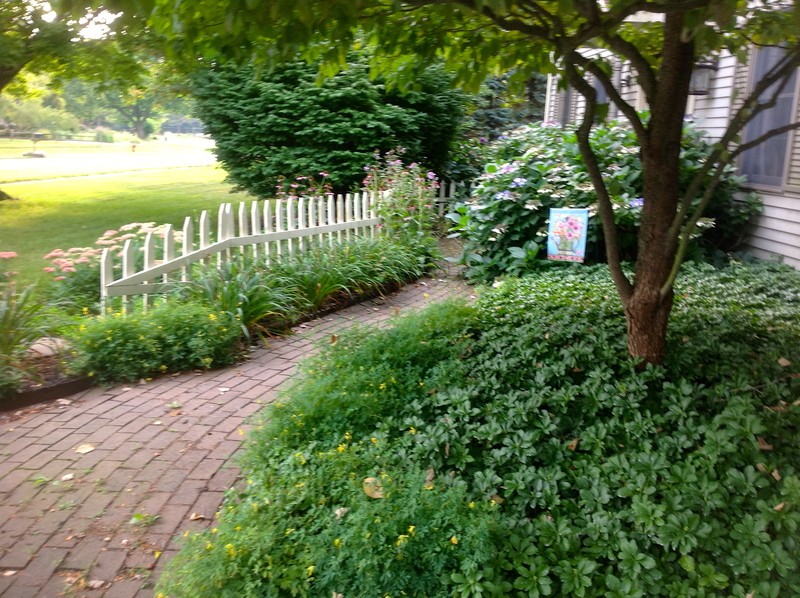 And thank you Linda Pifer, you were great to work for. 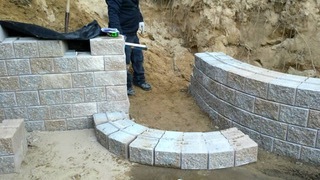 Constructed a 600 sq.ft. 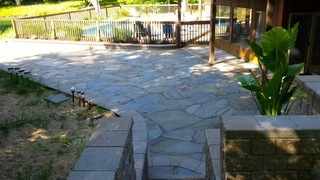 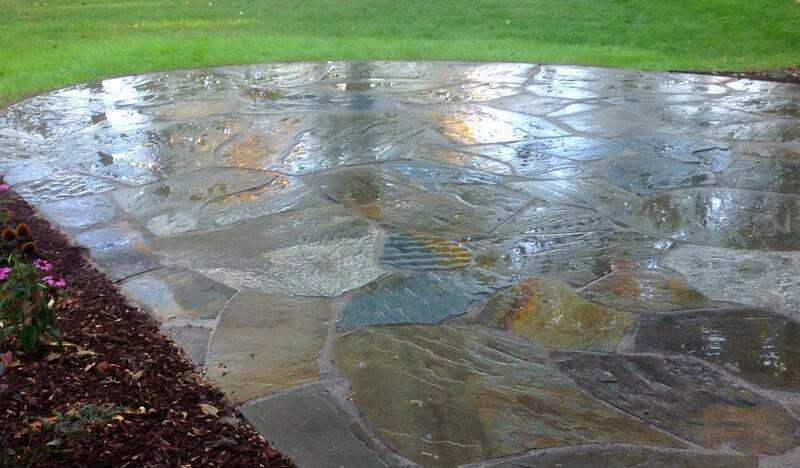 New York Blue Flagstone Patio. 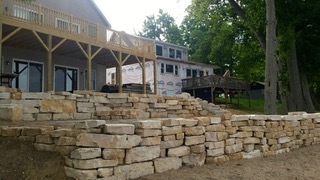 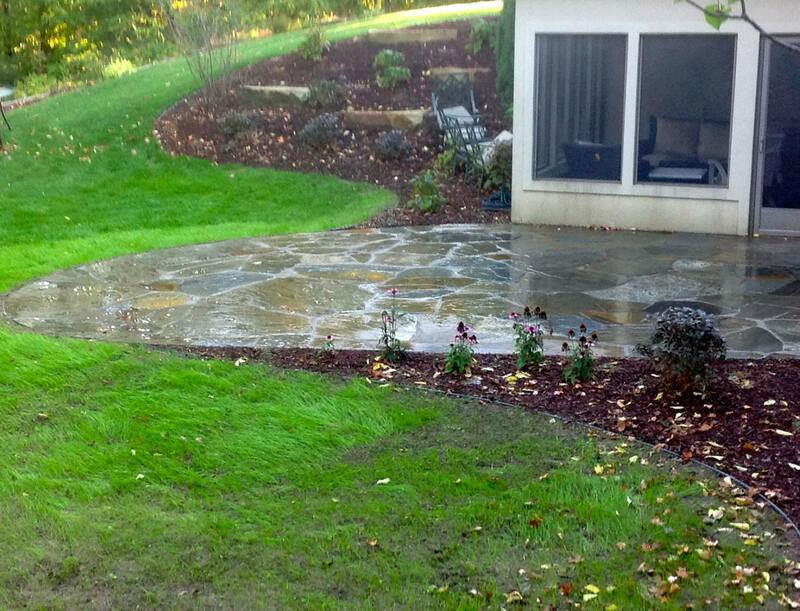 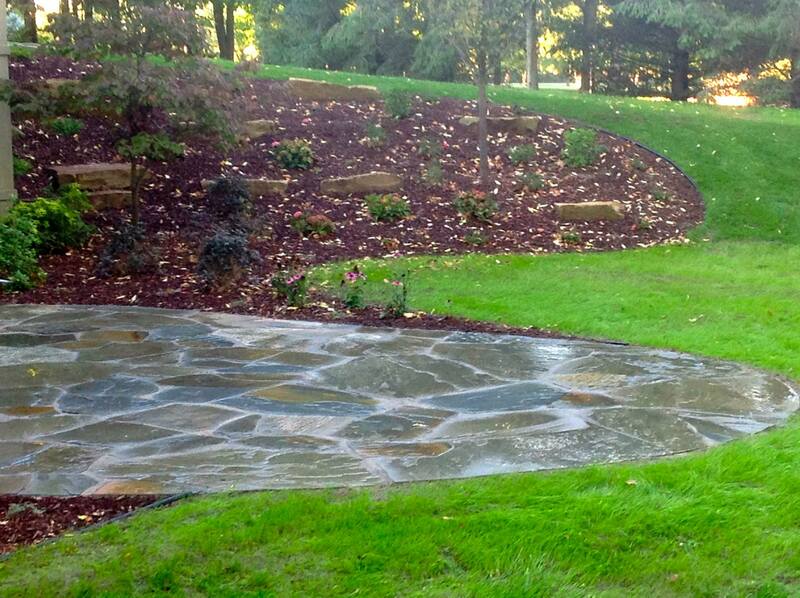 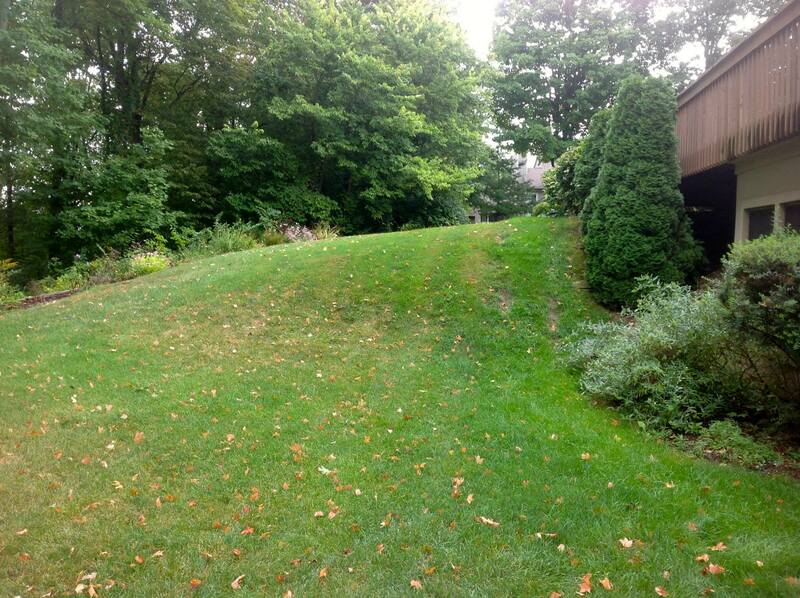 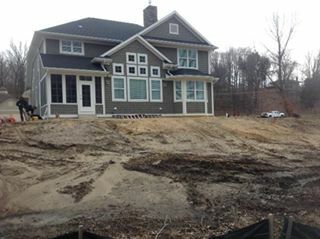 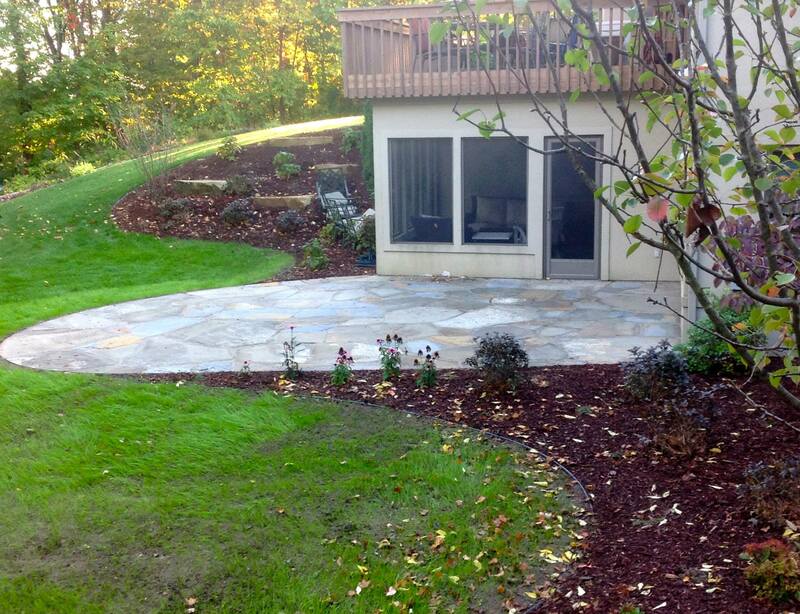 Installed eight tons of Michigan Sandstone outcropping pieces to retain the hillside. 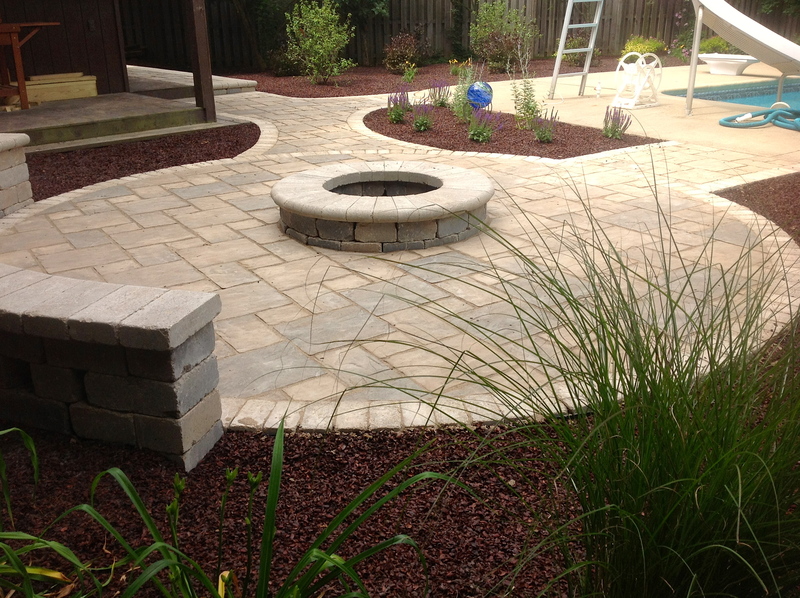 Plantings consist of a variety of perennials that will offer year-round color. 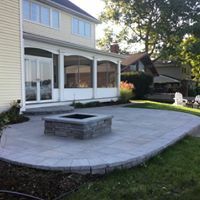 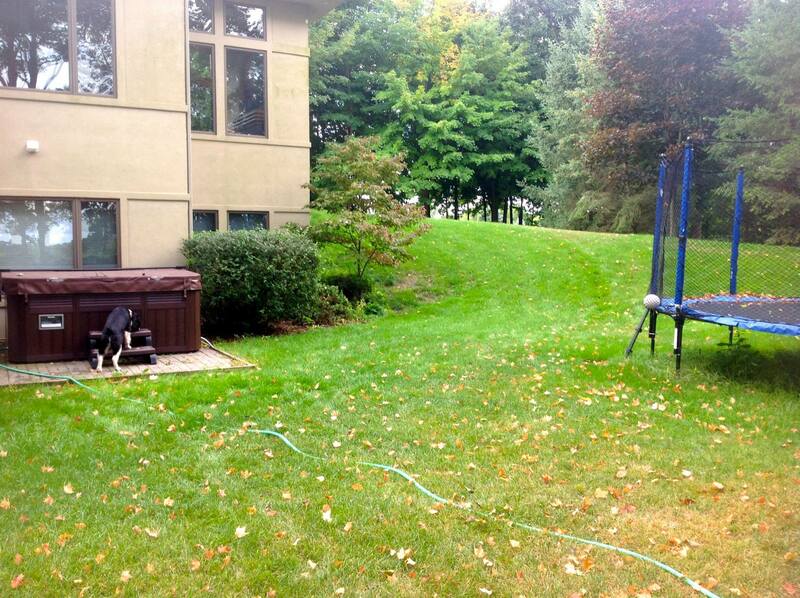 Nancy Tennant, VP Innovation and Adjunct Professor at Whirlpool Corp.
“I am recommending Jake Petlick as a professional designer and landscaper. 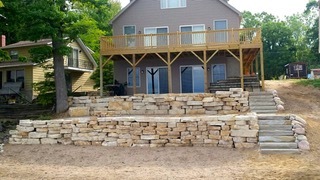 Jake completed a large project at my home this summer. 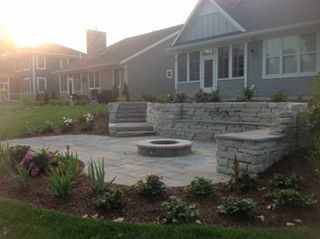 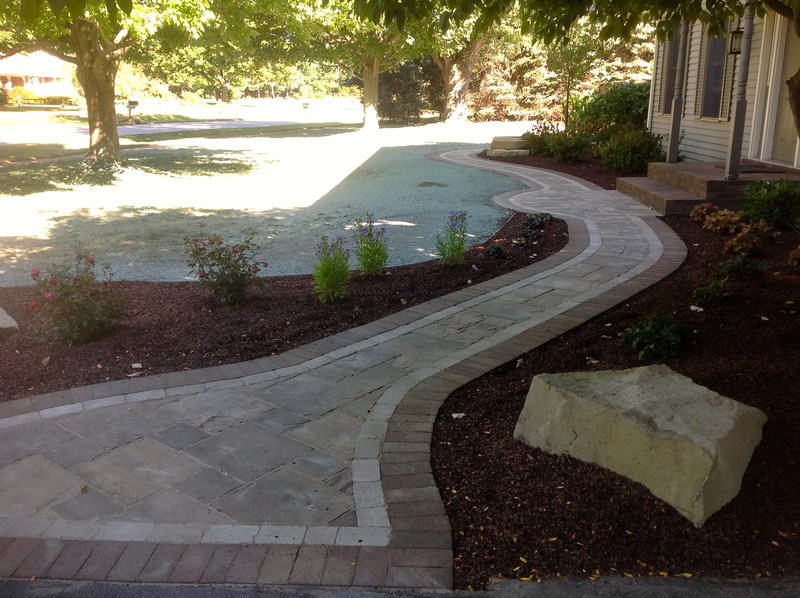 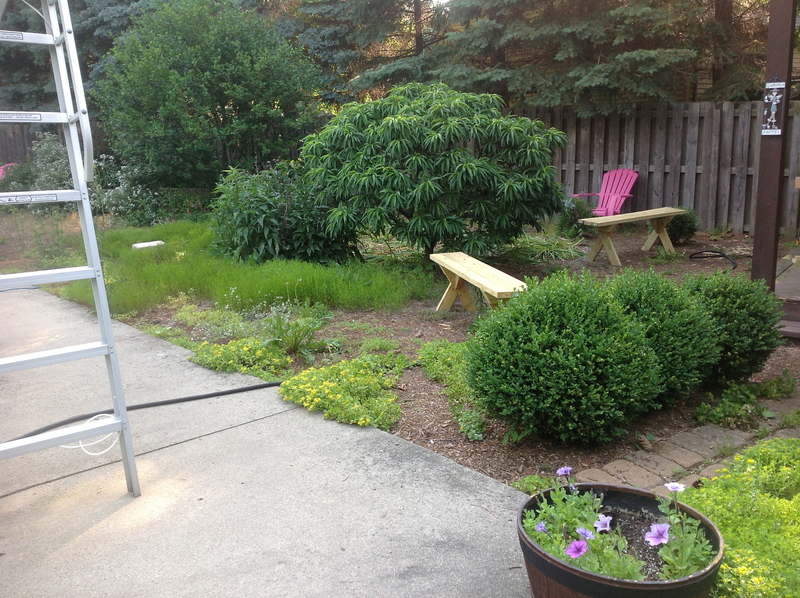 It involved a new driveway of pavers, a new stone wall, new soft-scapes, pathways and lighting. 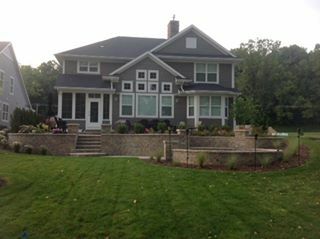 My home has a unique architectural style and Jake understood the style and the intent of the project. 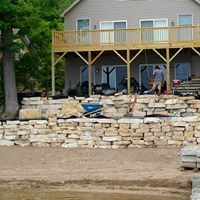 Jake is one of the few contractors I have worked with who puts the same intensity and care into my home as I do, both at a total project level but more importantly in the small details. 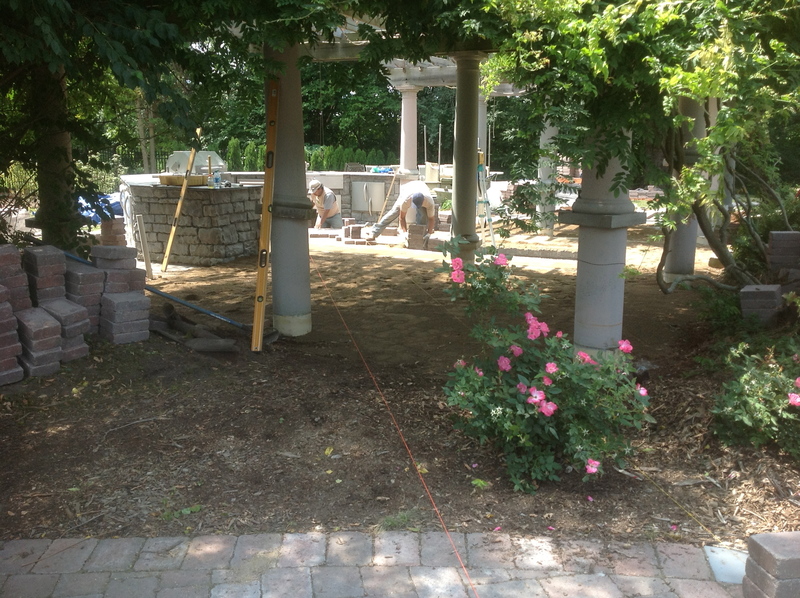 The project went very smoothly. 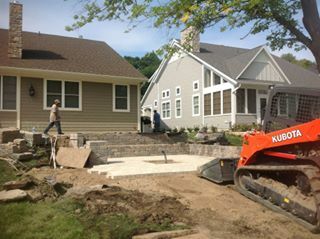 Jake and his team are true professionals. 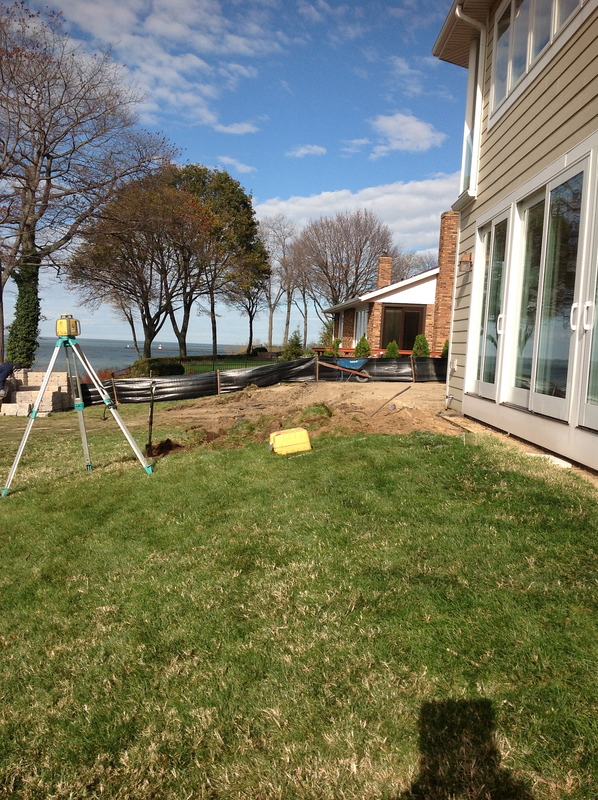 They listen and adapt to customer’s input as the project progresses. 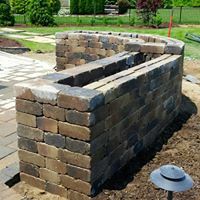 Their design skills are outstanding, They know what works and what does not. 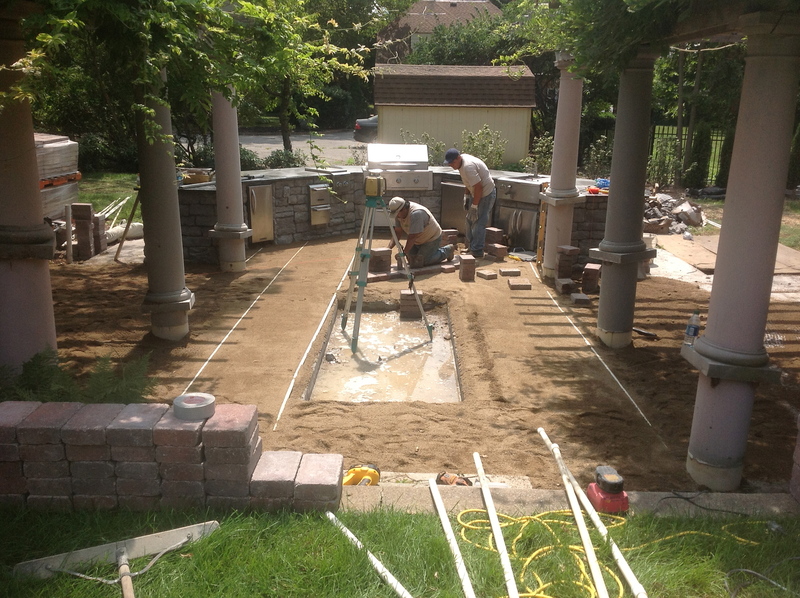 The entire team works efficiently to come in on time and under budget. 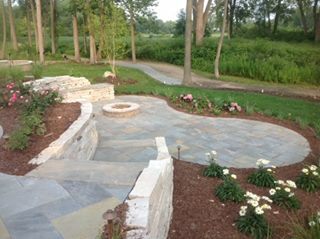 I highly recommend Jake and Lake Michigan Landscapes”. 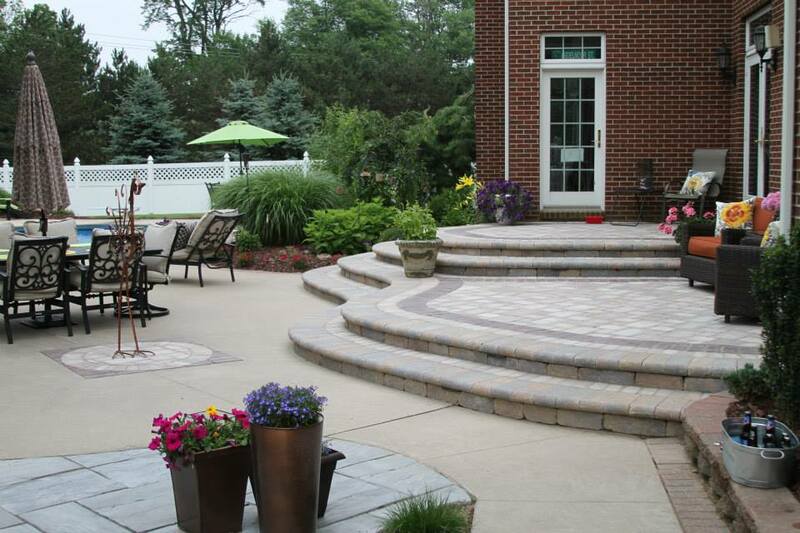 The focus of this project was to create a consistent living space on each of the three patio levels. 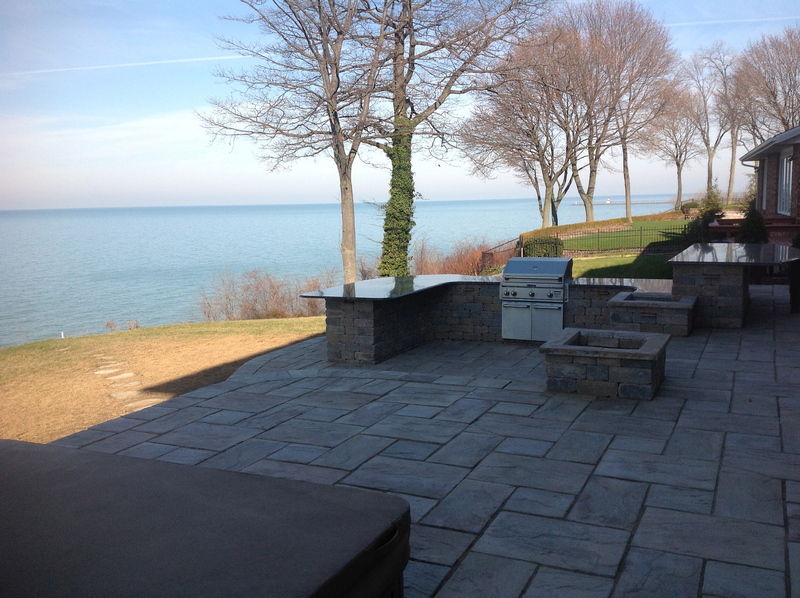 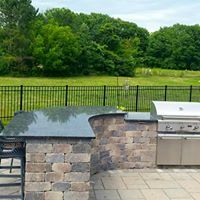 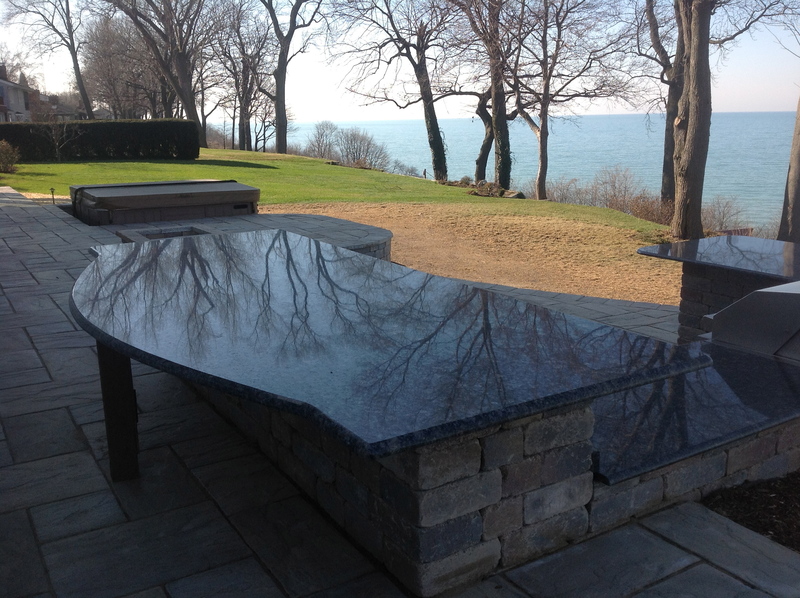 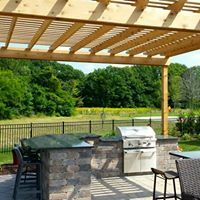 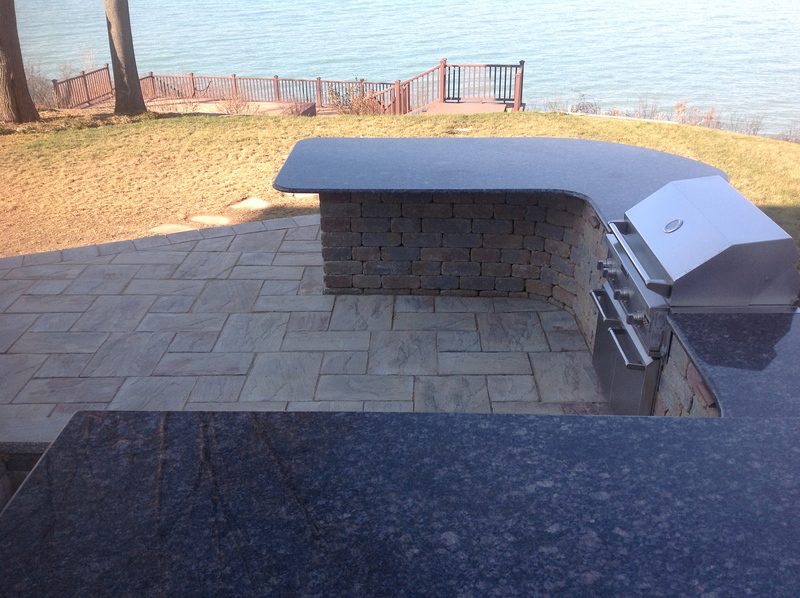 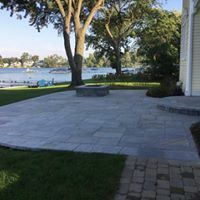 In order to achieve this, we designed an outdoor kitchen along with two separate seating areas where the homeowners could enjoy the beautiful view of Lake Michigan. 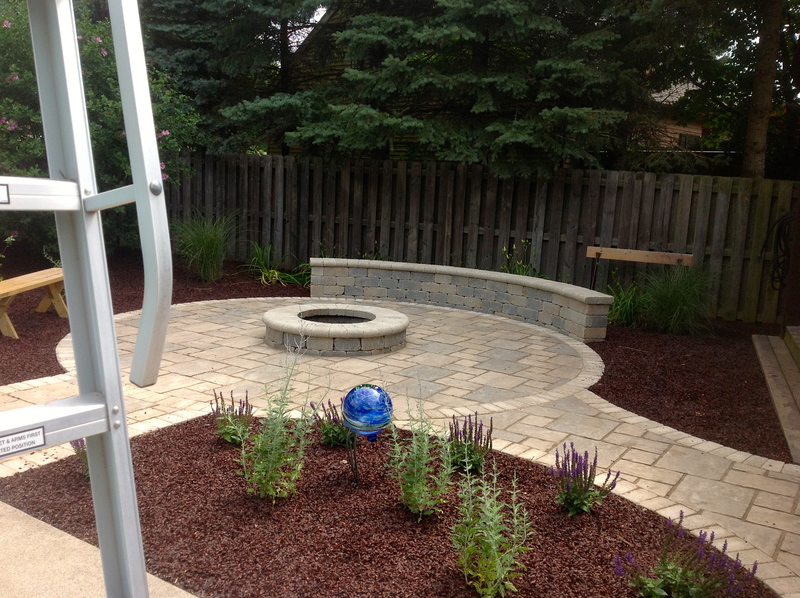 Project was completed within five weeks (from design process to installation) with a crew of four.